Ceramic products are no longer considered to be just wall coatings but a creative element to be used in architectural projects and for interior design thanks to its technology, uniqueness and quality. The collections can be easily applied in the projects of designers and architects, due to the versatility and variability of designs, colors and effects. Iris Ceramica Group has also developed new technology for indoor spaces that can benefit from the elegance of ceramic tiles and slabs. Also the kitchen can become a unique and futuristic space with Sapienstone slabs, these are easy to work with, in a wide range of furniture design applications, including kitchen countertops, tables, wall units and shelves, vanity tops, shower trays, baths and barbecue tops. In the bathroom, with a set of washbasins and shower trays that can be personalized matching the entire design of the space: floor, lining and furnishing and giving the environment harmony and aesthetic continuity. The possibilities of customizing products the solutions offered are endless: starting from the best material, best sizes, best cutting solutions for the specific requirements of the individual customer. Ceramics can be cut using a technique of engraving using waterjet cutting tools, that allows the designers to add style to the project by engraving all sorts of things. Iris Ceramica Group’s companies offer a wide range of products and services to meet all the needs of every customer. Our businesses values are quality, tradition, sustainability and innovation, so these are intrinsically linked to everything that is developed and created within the group. These characteristics can be easily seen by the attention and importance given to a new design or a new texture, from the attention while laying the tiles until the way our staff acknowledges and cares for our customers in order to solve a specific need. 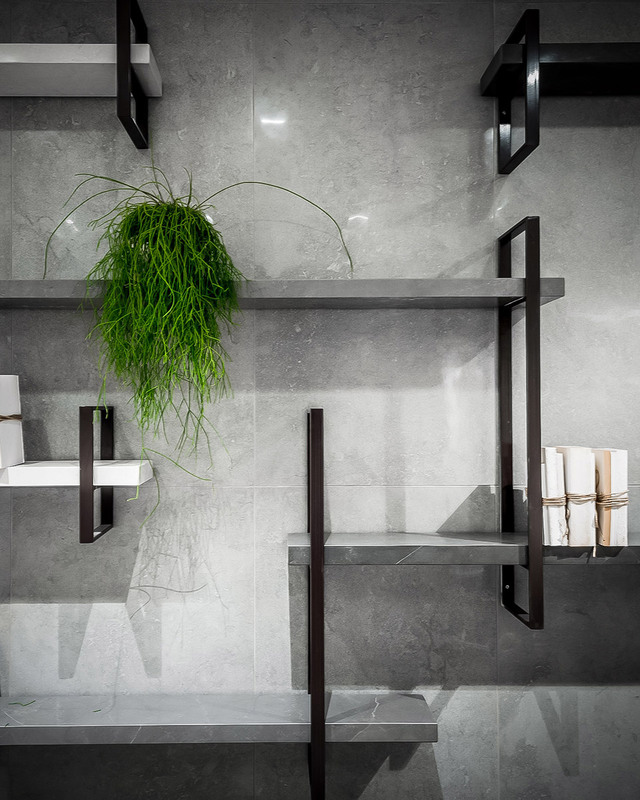 The solutions offered by Iris Ceramica Group are so incredibly innovative and are made to break the boundaries between surfaces for architecture and furnishings. The continuous improvement and pursuit of excellence regarding new solutions and applications combined with the continuous technological innovations make it possible to offer the most advanced answers to the needs of the customer. Ceramic products are incredibly resistant and therefore considered the best solution to floor and wall coverings for indoor and outdoor spaces. Contemporary architecture shows an increasing interest in flooring (classic installation or floating floor) and ventilated walls. The installation of these solutions is the last step but not the least important step in the work process because it’s very important to handle the product in a correct way, i.e large slabs (300 centimeters x100 centimeters). In order to guarantee the quality of the service and to prepare flooring installers to their activities, the Group has developed technical booklets available either to professionals or clients through training activities.